« Next Article: The Guardian: Is language a barrier for monolingual grads seeking work? Got a minute? How about a quick online game of hangman in Spanish? Checking out the word of the day on the don Quijote site, I just stumbled across the games page. Not a bad way to practice Spanish vocabulary and spelling (especially for beginners) while you take a quick break online break. 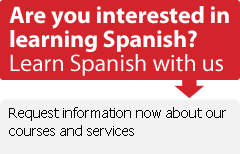 You can choose from Spanish hangman or Spanish word search.